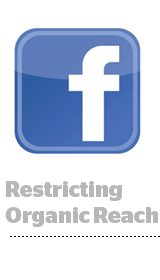 Facebook Pulls Plug on Organic Content Marketing – All Advertisers Must Pay to be Seen! Facebook’s shift from social marketing to performance marketing has caused organic reach for marketers using the platform to plummet to a record low of 1%. The low point means that for every 1,000 likes on Facebook, only about 10-20 consumers will actually see a brand’s page. But a panel at the SunTrust Internet & Digital Media Conference on Tuesday indicated while constricting organic reach irritates SMB marketers, big brands might reap the benefits of Facebook’s long game. Nanigan’s SVP of marketing, Dan Slagen, said no one should be surprised by Facebook’s pivot. “Facebook was very clear, 12, 18 months ago [that they were] changing from being a social marketing platform to a performance marketing platform,” he said. He added that while bigger brands stand to benefit as Facebook has the ability to offer better advertising products priced around performance: Using Instagram as a platform (it’s unclear what exactly Facebook is doing here, but it reportedly has an ad deal with Omnicom worth around $100 million), prominent placement in the news feed and preroll video ads. Facebook is also trying to get back into the mobile game. “Advertisers may not like seeing a decreased organic reach, but if they’re seeing strong ROIs from the marketing side of things, they’re going to keep deploying budget to the marginal dollar,” Slagen said. This is a risk for Facebook – Slagen said SMBs account for 50% of the company’s advertising revenue. But he also noted how Facebook’s Q1 revenue, following the shift in strategy, started slow, but grew significantly by Q1’s second half. By Q4, Slagen predicts pricing will increase by 10% and that mobile will drive ad pricing up. And the move to performance seems to be paying off for advertisers: Return on Facebook ads averages four times ad spend. Slagen predicted that emphasizing premium newsfeed ad placement will also invite shifts in advertising budgets. News feed ads are premium territory, and adding video to feeds deepens that market. He said Facebook video CPMs had the potential to reach those of linear TV. “If we think about video and where those CPMs can go, we need to think a lot more on the TV side [where] CPM is $10 to $18,” he said. Posted on April 12, 2014, in Automotive Social. Bookmark the permalink. Leave a comment.